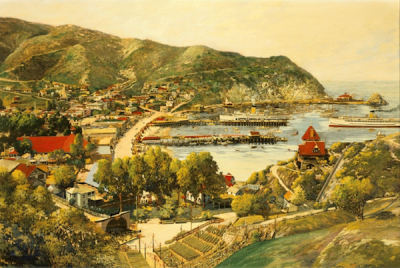 This 1920s view (gouache on board) of Avalon from Mount Ada on Southern California's Santa Catalina Island; shows the red roofed Holly Hill House to the right and the Greek amphitheater band stand below. At the steamer dock is SS Catalina with SS Avalon approaching in the harbor. Sugar Loaf rock and the original casino building are shown upper right. This page was last edited on 29 April 2017, at 09:39.